Richard Jones: How did you find out about the Keppe Motor? How did you go about getting more information about it? Professor Alves: It happened like this. I was searching the internet for information about solar panels. At the time, I was working on my master’s degree and just like that, by sheer coincidence, I found the site about STOP Association, which is Keppe & Pacheco today. This is how I found out about the Keppe Motor. I became very interested in the subject and then I made a phone call to STOP at the time and travelled to Sao Paulo for a visit in order to find out more. I was very well received by the engineers Cesar Soós, and Roberto Frascari. So first it was through the internet, and as I got more interested I went to Sao Paulo to meet and find out more from Cesar Soós and Roberto Frascari. They explained to me more details about the new physics, the technology of the Keppe Motor, the principles from Dr. Norberto Keppe. With this I became really very excited and interested in the subject, especially because of my professional background working in a company in the search for new technologies, technological innovation. And the idea of bringing this content to school came up. At that time, I was informed by Cesar Soós that there was no school yet, effectively developing the new physics with the students. So this was more or less the beginning, by chance and after I knew I started to research more about it and getting to know even more led me to Sao Paulo and it was there where this idea to bring this to the students began. Richard Jones: For you, what was the most interesting concept about the Keppe Motor? Why are you introducing this in a school or a college? Is it something revolutionary or just something else? What was the most interesting principle that interested you enough to introduce this physics within your school? Professor Alves: So first of all, it`s like this. We’ve studied with the students here the topic of innovation and we found out about an international standard ISO 50001 in the beginning of 2010, 2011. And also, it existed already ISO 14000. Therefore, both ISO 14000 regarding environmental sustainability and the standard ISO 50001 regarding energy optimization, so we perceived that the Keppe Motor’s theory was in compliance with these two standards, that these students here today, will apply it tomorrow or in the future within their businesses. Another important point is that with the new physics, the technology applied to Keppe Motor, the heat of the running motor is very low compared to conventional motors. The high heat of conventional motors is a huge problem today in industrial equipment. So, we saw this connection, the Keppe Motor which heats very little applied to future industrial equipment will solve this problem and also will contribute to environmental sustainability. This was one of the factors. Another factor as well, is the saving on electrical energy that Keppe Motor provides, compared to conventional ones. For example, we have here a normal type of fan with the motor and another fan of the same size. And with the students in the mechatronics lab, we measure the multimeters, the devices and we were able to prove together with them this electrical energy saving. Sometimes, its about 60%, sometimes even up to 70% compared to the conventional ones. And this related to the industrial field, in the future, that we hope could be as soon as possible, will solve, help to solve, this operational problem of the industrial equipment. Also, another very important factor that has motivated us, was the energy itself of the pulse current. Because generally, in the conventional electrical motors, we work with AC and DC type of current, which is what we find in the books and explain to the students. And, anyway we`ll be rescuing the pulse current which is a very important factor for them to research and study. Therefore, it was a sum of factors that motivated us to introduce this within our course. Richard Jones: When new concepts, new theories appear within science, this sometimes causes a great disturbance many times, the paradigms. Professor Alves: Yes. Resistance to what’s new, resistance to changes. Richard Jones: And have you noticed this when you tried to change? Professor Alves: With the students, there was no resistance, with the students. But I had resistance with my colleagues, the professors. Mainly physics professor, the traditional physics ones. 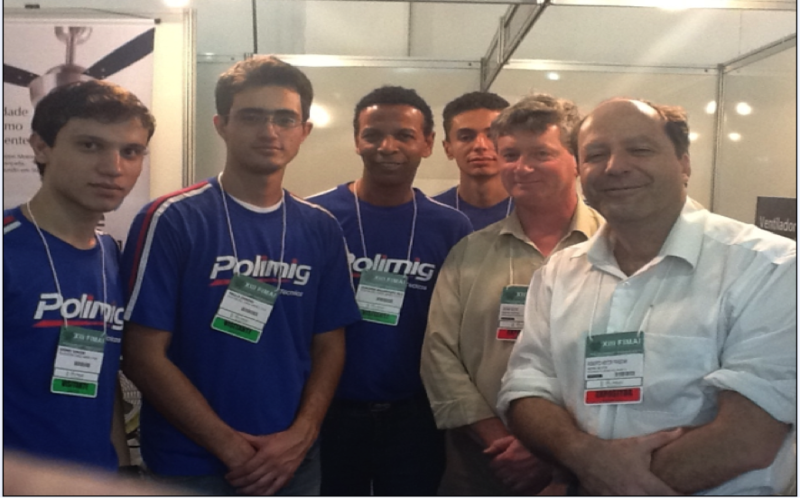 Because, here at POLIMIG, the student undergoes the technical course parallel to the traditional teachings. 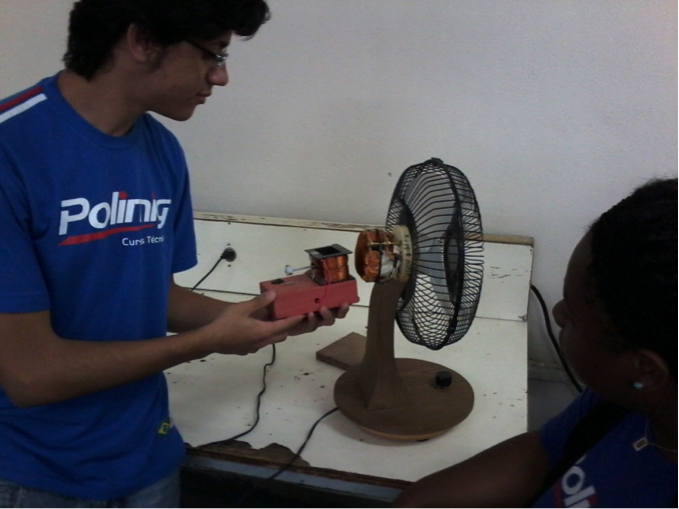 Therefore, the students have conventional physics classes parallel to the classes of mechatronics and electricity. So at first, some colleagues, physics professors mainly, told me, as we say it here, that this could not really be the truth, that there was no scientific study yet, no doctor’s degree thesis. So some really spoke out about that, but I observed that it was probably because it was easier, without making any effort to say that it doesn`t work than to make this change and try something new. They wouldn`t need to do any research, or extra work, laziness was a factor here. But this was not the case with me. But today, as we have completed almost two years working with this in our school at POLIMIG the ones that didn`t believe very much are already supporting me. But, I still have some, about three or four that, how can we say it, that haven`t come around to it. No, seriously, they said that they don`t believe in that, but they are a minority. But, regarding the students I didn`t have any problem. Ive already worked with this with more than 120 students, considering all groups that I have developed this subject with. But, at first I really met strong resistance. I don`t know if this also happens to others, but what I`m saying is what I found here, because I wish I could say that everybody liked it. Mainly its that kind of teacher that has already worked for many years in physics. It happened with me and still happens. But, thanks to my persistence, the students themselves are commenting to the other teachers, and when they hear the students talking about that in other classes, in the corridors, during the science fair then they really need to see that this is a reality. Richard Jones: An issue here for a person who doesn’t believe is that the motor works, so how is it then? You get asked how does the motor work with 60-70% efficiency and even more? This is important. But what are the physics principles that the new physics contradicts? Professor Alves: Well, then it would mainly be the matter issue, energy, energy and movement, that would be that theory from Isaac Newton, from the traditional physics. So, this new physics has the essential energy, where it says that the essential energy is doubling, essential energy enters in the dimension of time and space through the typical format of hurricanes and galaxies. And, also the main fundament, is that in the traditional physics, they speak about Isaac Newton, action and reaction, and in the new physics it is demonstrated that there is action and its complement. So, it`s there where there is this difference. In traditional physics, action and reaction, in the new physics from Dr. Keppe, action and its complement, that even this complement is what is, it is used in the Keppe Motor. Therefore, this was the point we have observed. Another point as well, is that the new physics, it gives emphasis to vibration, and in the new physics vibration is essential. And also the issue that matter in the new physics is a result of energy, the non-visible energy, the energy called essential energy. Because in Einstein’s physics, matter transforms itself into energy and energy transforms into matter, that is, they are equivalent. And in the new physics, matter and energy come from a third element, which is the subtle energy, the non-visible energy. So, we made these comparisons and we have showed them to students in a way that they could understand. Since they already know very well the traditional physics, they can make this comparison. But, we have to give some examples and always show that this already works in practical terms with the Keppe Motor, by using the kit we have. Richard Jones: Interesting. I also notice that your students are learning other things, drawing, arts, math… Have you noticed a change in the way the students think about other subjects as well, with this new and deep understanding of the physical world? Professor Alves: Yes, I got it. Actually, up until now, we haven`t observed that, because our focus is more based on reassigning this knowledge, this theory and then applying it here in the lab in other devices. So, I haven`t had the opportunity to observe this yet, and also because the contact that I have with these students in this subject is only once a week. So, I didn`t have the focus to observe this, but now that I am motivated by your question, we are going to start observing this from now on, to talk to the teachers from other subjects. But, at the moment, I cant give you an answer because it is something that I haven’t observed. Richard Jones: Yes, I understand. Final question, I think. What, in your opinion, are the consequences for the current science with this introduction of the new physics? Is everything going to change, does everything need to change? How do you understand the impact of this new physics on the current science and in our world? Professor Alves: First of all, I believe that even though we already know, it is a reality, Dr. Keppe has already published his book, we have a site, promotion, many people are putting articles on the internet, in magazines. But there are still many from the scientific field that dont know this new physics from Dr. Keppe well, so I believe that we have to promote more in order to have more results. But I believe that by what I`ve been studying, you also know, that we are going to have a very positive impact mainly in this issue of environmental sustainability. Because today we are facing these issues with the nuclear plants, environmental degradation, so I think that from this aspect of sustainability, environment, energy optimization, that the new physics is going to have an opportunity to occupy its space within the scientific world. Because today, there is this great global concern with the environment, energy optimization, so I believe the new physics in a short period of time, let’s say, in the near future, we are going to see this conscientization. But, I believe that although we defend, understand and believe in the new physics, we need to do even more to get to this point. For if we don`t promote it a lot, it will take much longer for the scientific community, so to speak, for them to have the knowledge and be able to give their opinions, make their assessments. Thats why I believe that the way is to introduce it in the schools, because these students, tomorrow, next month, the following year, they will be inside the companies. They will be producing their papers, monographs, and can through that, contribute to better disseminating the theory of the new physics for the scientific community, for the professors of this area, entrepreneurs, have this conscientization. Because, sometimes, when I`m going to speak about this with a new group of students, or a new teacher, they say: Well, I`ve never heard anything about that, I`ve never seen an article or a paper in a scientific journal. Therefore, we really need to promote this idea. And it seems now, Vera just told me, that recently an article came out in the United States, saying that there are some schools interested in this subject. So we are very pleased to hear this. But, I believe that through sustainability, the environmental issues or energy saving together with ISO 50001 is how we are going to have a better rise of the new physics, with the Keppe Motor being used more as a consequence. I would like to mention one more thing, that is when we started to develop the new physics with the students, we had to alter the methodology. We had to make an alteration to use the strategy in order for the students to understand better. Can you understand me? I don`t know if I`m speaking too fast. So, when I gave the first class, in 2010, at the end of the year, I started with a class inside the classroom showing them the new physics theory, the issue about energy, matter, essential energy, but I perceived that the students didn`t have too much interest, because it was too theoretical. I perceived that, it`s very common among young students, 20, 21 years old. Therefore, for the next classes, I changed the strategy. The students, they like very much lab classes, and not too many classes inside the classrooms, with the teacher writing on the board. Thats why I changed the strategy. Now, I start showing the Keppe Motor in the lab. The first thing, I take them to the lab, show them the Keppe Motor and in the following classes I introduce the theory about the new physics. So, it got much better and the students get more motivated. Because, first they see in practical terms and after I enter with the theory in the class, showing Dr. Keppe`s book, The New Desinverted Physics. Then, this was the strategy I used, which is working very well up until today. Even, when we do a presentation at scientific fairs at POLIMIG, with people coming from other schools that don`t know anything about physics, we also first show them Keppe Motor working, doing all measurements with the multi-meter, using devices, and then we talk about new physics theory. And then, people understand much easier. Whereas, the way I was doing in the beginning, by starting with the theory and only after showing Keppe Motor’s application in practical terms, was not interesting. So, in this way now, it got much better showing first Keppe Motor applications, its advantages compared to a traditional motor, and then it gets much easier for them to understand the essential energy, resonance after seeing it right from the beginning, the Keppe Motor working in a real piece of equipment, an electric device. So, this is an important pedagogical didactic factor that we had to do in the school’s methodology.